As I pulled up and parked my vehicle facing the main room, Kelly Anderton waved to me. ‘Oh no I thought, had I forgotten our 1:2:1. 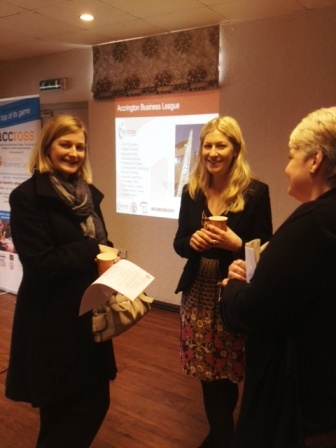 Earlier Kelly had told me she would not be at this meeting so we agreed to meet at the next Accrington Business League. False alarm, Kelly was here to help set the room up before leaving for other college business. This was my first meeting for a long time without meetings booked before or after. After booking in I moved around the room freely greeting friends and being introduced to visitors. Shortly after my guest Jay Motorwala, MD of Caritel Ltd arrived. 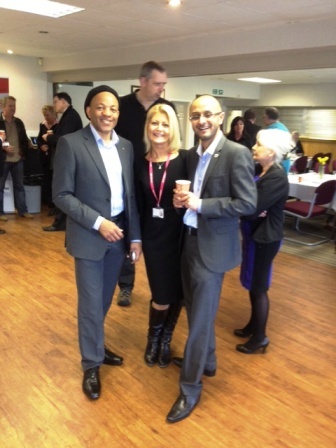 I introduced Jay to Paul of IT Assist and Natalie from Creig Accountants. Bernie soon brought the room to order minus Rob Heys, MIA (Missing In Action). Bernie delivered an impromptu introduction and got the meeting underway. I was seated with another guest, David Baker of Peritte who specialise in Business Finance. I’m looking forward to arranging a 1:2:1 with him. Another attendee making his first RBL attendance was Phil Thompson Key Security Services Ltd. The table captains led the way and we continued with the familiar format. It was soon time to move to another table for the next innings. As we neared the end of the second innings it was ‘pie time’. Before the presentation slot, Bernie allowed a few announcements. Alison Drive made an impassioned plea for help and support for a Bacups cheerleading group ‘Pioneers’ who qualified for the finals of the European Championships being held in Italy. They desperately require help to fund the trip. Conspicuous by their absences was Jo Fulthorpe of Hyndburn Enterprise Trust and Chrissy Pilkington East Lancs Chamber of Commerce. Julie Young, Spencer Fold Management Services, announced forthcoming workshops to assist new business owners (Details from Julie). Today’s Presentation was made by Bill Campbell, BDA Store First. Rather than a business presentation, Bill chose to share his journey from young aspiring professional footballer to his current role as business development manager with Store First, Accrington Stanley’s FC shirt sponsor. Bill seems to have enjoyed most his working career with little evidence of regret. When situations dictated or necessitated a change of direction, he approached them with a positive mind set and moved forward. Bill also shared details of an event that threatened his life. Following a routine check up Bill was diagnosed with prostate cancer. All the more of shock to Bill and his family, as he showed no signs or symptoms of the disease. Immediate action had to be taken. Bill and his family faced the challenge of preparing for the immediate future with no guarantees of the outcome following medical interventions. I have sat at the same table with Bill several times during League meetings. He always brings a positive vibe to the table. Bill is ‘old school’ and he admitted to me that networking this way alien to him. However, along with his positive attitude he displays a willingness to learn and embrace new methods and technology. He is also very affable and makes friends easy. During his post treatment regime Bill drew strength from writings of others who have faced adversity and triumphed through. The Chimp Paradox, by Dr Steve Peters, the psychiatrist behind the winning Olympic GB cycling team. English Rugby’s Jonny Wilkinson MBE, Tackling life. Next on Bills list of must read is the story of Apples late Steve Jobs. As Bill chatted on he conveyed the change in emotional states as he tried to come to terms with the prognosis and treatments, but the only two emotions he displayed today were Happiness and Joy securely bolstered with positivity. Rob usually delivers a message regarding good mental health and strength but I am sure league members will have reported back that Bill delivered a clear message today. Store First is no ordinary storage company and they do not trade on price. They work hard to deliver a bespoke package whether you are a commercial or domestic client. Their facilities include Virtual offices and leisure facilities. Visit their web site for full service range, you will be impressed. Bernie thanked all for attending and closed the meeting. 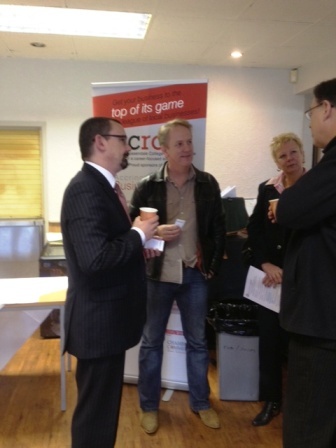 As is now becoming customary several members and guests stayed behind to network further. Another match over with everybody coming away as winners except possibly Rob. I got the impression that Bernie’s not used to being stood up! Good luck mate. 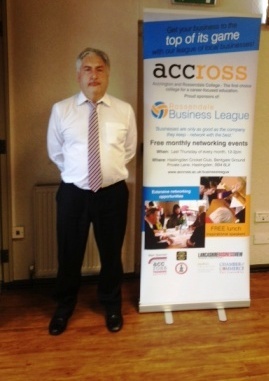 Follow the links on ACCROSS for details of the next Business League Meeting. This entry was posted in UK Chip & PIN Ltd. and tagged accept credit cards, authorisation, barclaycard, card processing, cards, Credit card, Debit, first data merchant services, interchange, low merchant fees, lower merchant fees, merchant account, merchant bank, merchant fees, Merchant Services, payment terminals, PCI, rates, retail merchant services, streamline, switch merchants #Lancashire #Rossendale #Burnley by Cornel Sampson. Bookmark the permalink.